A trio of quasars is beginning a gravitational dance that should hasten the merger of two of their supermassive black holes and kick the third out on a high-speed journey through intergalactic space, according to two teams of astronomers. The three quasars -- supermassive black holes surrounded by disks of hot gas as big as the solar system -- form a system known as QQQ 1432. They are about 10.5 billion light-years away, which means we see them as they existed about three billion years after the Big Bang. 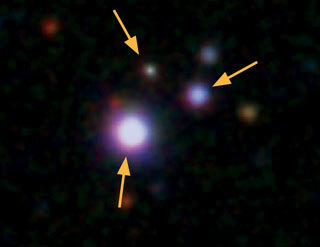 Astronomers discovered two of the quasars in 1989, but only recently found the third, which makes QQQ 1432 the first known triple-quasar system. Two of the three are inside galaxies, while the third also appears to have a host galaxy, said Caltech astronomer George Djorgovski, who led that team that studied the system. The quasars are about 100,000 light-years apart, which is roughly the diameter of the Milky Way galaxy. One of the black holes is several billion times as massive as the Sun while the other two are substantially smaller. As the galaxies move closer to each other, their gas clouds will smash together, giving birth to new stars. At the same time, though, more gas will be funneled into the quasars, which will slow down or halt further star formation.